Jamaican Breakfast Food...the Truth about It. 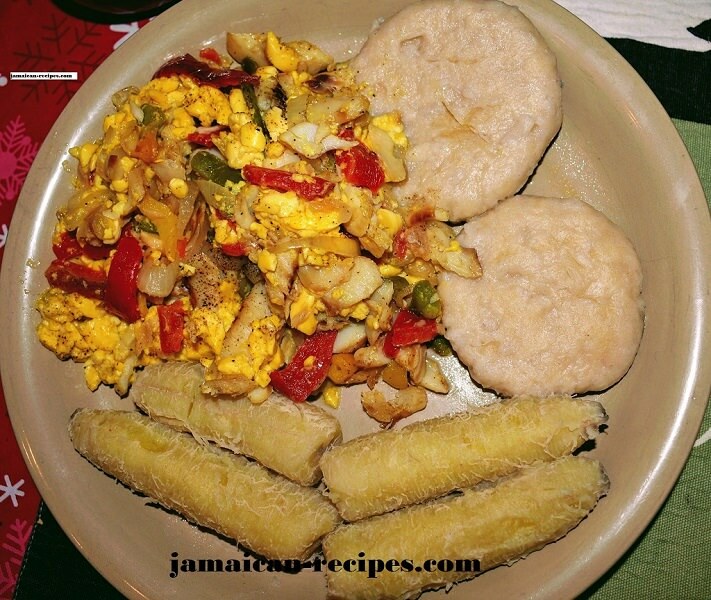 Jamaican Breakfast is known around the world as Ackee and Salt fish with Fried Dumplings, period. I don’t know how this information got so much attention, when in all fairness, it’s only partially true. The truth is Ackee is not an all-year fruit; it has its season just like all other fruits in Jamaica. So it is fair to say that during its season it is served as the main dish at breakfast and dinner. But it is not the only food we mostly serve for breakfast. What is Ackee? And why is it so unique? Well, that is the sixty-four thousand dollar question. Ackee is a vegetable that grows on a tree, and some say it’s a fruit, that must be cooked. I agree with both definitions. When it is “fit”, as we would say, the reddish skin spreads apart to reveal the gold-colored fruit with three shiny black seeds that look like eyes. The three pegs of the fruit are then removed and cleaned by removing the red paper-like growth that’s naturally imbedded inside the fruit. It is then washed in cold water and boiled by itself sometimes with a little salt. I‘ve eaten it raw from the tree just like that after it’s cleaned, when I was a youngster (trying to get a full-scale deflection on my macho-meter). It tastes like mashed potato with soap; I would not recommend eating ackee like this at all. Eating it like that would surely turn you off. There are rumors abound in Jamaica about ackee’s poisonous qualities. Honestly, I have never seen or met anyone who had been a victim of this alleged poisoning. And I am not saying that ackee poisoning never occurred. I just don’t know for sure. You may not know this, but the United States Food and Drug Administration (FDA) lifted a 20-odd year-old ban on the importation of ackee into the country just a few years ago. I suspect that after years of tests and biological scrutiny, they came to some scientific conclusion that ackee was not that bad after all. Then again, the ackee that is imported into the United States today is canned and soaked in brine. And now you know, the chances of your ackee being poisonous are between slim and none. On Sundays, Jamaican Breakfast is like a dinner meal in many households throughout the island. You are presented with such a variety of foods that you become satisfied as soon as you sit down to eat at the dining table. And during the week, you may eat some of the same type meals served for breakfast, for dinner. I don’t think most Jamaicans pay too much attention to this eating behavior, because you have to eat what’s available in most cases. Another important factor in determining the outcome of your breakfast is the distance you are from the urban areas. People in the urban areas will consume foods that are convenient to prepare and easily obtained in supermarkets and local groceries. The rural folks have the tendency to use field grown foods, which are close to where they live. So you see how the breakfast can vary based simply on geography. That is urban versus rural. Jamaican Breakfast would not be complete without a hot beverage called “tea.” Now the teas are divided into two categories, “bush tea” (herbal)and the other canned or dry packaged drinks called by their commercial names such as, Milo, Horlicks, Vita-Cup, Cocoa, Green Tea, Ovaltine, and Caafi (Coffee if you are from Upper St. Andrew, usually Dark Roast, sorry no decaf). “Bush tea” is, Cerasse, Lime Leaf, Black Mint, Pepper Mint, Soursop Leaf, Donkey Weed, Fever Grass (Lemon Grass), and Cinnamon Leaf. Except for Donkey Weed, all these delicious herbal teas, also known as “bush teas,” are now available in many different grocery shops throughout Jamaica, United States, Canada, and Britain. Our tea drinking tradition is definitely from British colonial influences. Because Jamaica is a hot country with temperatures ranging from 74 degrees F to 96 degrees F, the need for tea is not that great. But people still find reasons to consume many hot beverages like teas and soups. I suppose the loud belches and ooh’s and aah’s followed by, "Excuse Me!" validates the explanation, "it tek di gas off mi stomach!" In some instances the Jamaican Breakfast looks like the standard breakfast throughout the English-speaking world. Foods like Bacon & Eggs, Egg Sandwiches, Coffee, Hot Chocolate and the like are still consumed with our Jamaican breakfast foods. Bammy- A cake made from the Cassava root. This ground based root is also known as Yucca. Breadfruit- A tree vegetable, when roasted has a bite like bread and when cooked tastes like a potato. Butter-y’all know what butter is. Eggs-you know what eggs are. Boiled Green Bananas - Banana is a vegetable before it’s ripe. Iron food. Guava Jam - A sugar-sweetened jam made from the Guava fruit. Oatmeal Porridge - Cooked in water with milk, sugar, vanilla, salt, cinnamon, and water. Salted Mackerel- Fish cured in brine. Sardines-Canned Fish in soy bean oil. Sunday- Ackee, Callaloo, Hardough Bread, Fried Plantains, Soft-boiled Egg, Beef Liver and boiled Green Bananas, Hot Chocolate (from home-made Jamaican chocolate) or Coffee, Butter, Roast & Fried Breadfruit, Fried Dumplings, Fried Bammy, Bacon or Ham, and Water. Monday-Sweet Potato Pudding, Fried Eggs Sandwich, "Bush Tea." Wednesday-Sardines and Water Crackers, Fried Plantains, "Bush Tea"
Thursday-Oatmeal Porridge, Toast with Butter and Guava Jam. Friday-“Bush Tea, ” Bread and Butter Sandwich, Hard Boiled Egg. Saturday-Salted Mackerel with Boiled Green Bananas, "Bush Tea"
As you can see, there are so many different variations to the Jamaican Breakfast. And these are just some of the foods we use in making breakfast. If you live close to the sea you may have a different kind of breakfast, like steamed fish, or conch, or crab, who knows. As I have stated before, your geographical location can change your Jamaican Breakfast.